Product #21141 | SKU 106954 | 0.0 (no ratings yet) Thanks for your rating! 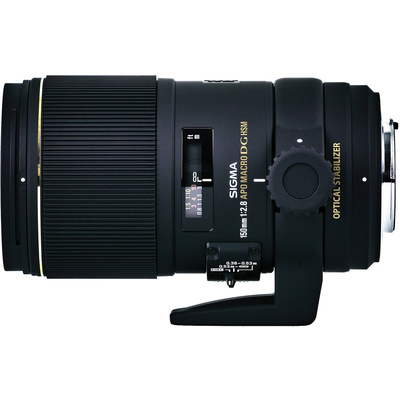 To maintain high optical performance from infinity to close-up 1:1 macro photos without accessories, this 150mm lens incorporates a "Floating Internal Focusing" (FIF) system. As a result, the lens also features a non-rotating front lens group which makes it easier to work with polarising filters. The HSM feature provides ultra quiet high-speed autofocusing as well as full-time manual focus override. Optical image stabilisation (OS) allows you to use shutter speeds 4 stops slower than would be possible without OS. The improved DG lens design corrects for various aberrations, using 3 Special Low Dispersion (SLD) glass elements. This macro lens is specially coated to get the best colour balance while cutting down on ghosting caused by reflections from the digital image sensor. The lens provides the utmost correction against lateral chromatic aberration which is a serious problem for digital SLR cameras. Close focus capability of 38 cm, with 1:1 magnification. Three Special Low Dispersion ( SLD ) glass elements control various colour aberrations and assure high image quality. Offers Sigma's OS System (Optical Stabilisation) allowing handheld photography even in low-light situations.